This is our first job as master thieves and it couldn't have gone worse. We are the Brothers Locke: Mouth, Echo, and Sharp. Identical triplet brothers who live in the Dea, particularly the West of the Dea which is littered with criminals, monsters, corrupt politicians, dark magic, and mercenaries. Mouth is hard of hearing but has a voice that is powerful enough to level buildings, Echo is legally blind but can hear so well he can decipher information on radio waves, and Sharp is mute but has vision so enhanced he can see over great distances and in different spectrums of light. We were hired by this crooked guy called Von Strauss, who fancies himself a tough guy but he really isn't, to steal a box from The Miscellany, the richest and most powerful man in the West. What he didn't tell us is that what we were stealing is an ancient artifact called the Key of the Spire which made us targets of every monster, mercenary, and madman on this side of the Dea. Now, our lives are on the line almost every day as we try to find a way out of this while not allowing this maniac to destroy the Dea and us in the process. You will enjoy The Brothers Locke: An Urban Fantasy Adventure. Review: I loved how this collection was told in episodes and the first episode Solas was amazing it introduced us to some amazing characters like Perry; a secruity officer in a shopping center in pursuit of a thief. We are also introduced to Avidity, the largest city in the western part of the Dea and the thief turns out to be one of the brothers Locke who are identical triplets; Sharp, Echo and Mouth. These boys are very smart, cunning and very humourous.I love the fact all the brother has a disabiltiy of some sort and use it to their advantage rather than letting it be a hinderance. Sharp is unable to speak, but has perfect eyesight, Echo is blind but has amazing hearing he can hearceverythingcfrom radio waves to the communication of animals and finally Mouth Locke is hard of hearing but possessesca voice that could shake buildings. The brothers after the deal for their heist goes bad are recruited by Solas run by Dana and they seems to wants whatever the triplets stole. The world is a difintely cross between fantasy including horrid creatures that roam the night in search of dinner and sci-fi/dystopian with the slightly desolate wastelands and the technology and inginuity the characters use to survive. The opening to the second episode has a distinctly dark feel to it and Perry's storyline takes a serious nosedrive and despite now even begin a 1/4 of the way into the series collection I was on the edge of my seat. I also liked the developing relationship between Dana and Sharp as she seems to understand the struggle Sharp faces at being partically invisible. As we approach the 1/4 mark in the novel, Dana and Sharp have been seperated from the rest of Solas and have to make their way alone to the next check point but the Solas team are facing some trails of their own. As we cross the 1/4 mark in the series a new foe is introduced in the form of sky pirates and Captain Horsefly who wants to use the Locke brothers skills to retrieve some gold for him that was stolen from him by The Miscellany who they stole something very valuable from at the beginning of episode 1. One thing I have to say at this point is I am completely in love with K C Hunter's writing and the cover art for each episode is just divine and I can't wait to read some other works by this author. I love seeing the contrasting storylines between the Solar team and The Miscellany working against each other and time. As we approach the half way point in the series we begin to see underlying threads of the plot leading us to believe the Solas' involvement in the Locke brothers lives was accident or coincidence but rather a very carefully laid out plan. The brothers end up at the Pharracrop in the East a far cry from the desolate wasteland of the West. As we cross into the second half of the series things take a strange turn once again when the strange creations sanctioned by the Miscellany attack Pharracrop and take back the Spire and its key. Solas and the brother now have the mission of retriving these items before they fall into the wrong hands. 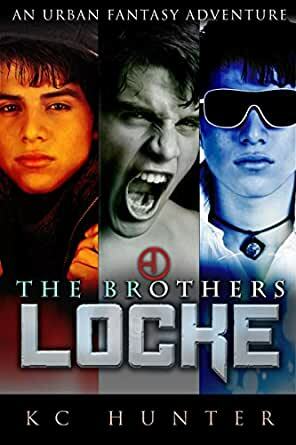 As some truths and true alligences are revealed things become darker and more lives are on the line than ever and I have a feeling that the Locke brothers are going to be the key to it all. As we cross into the final section of the series and the final episode Bando and the other have reached the Spire dragging Dana with them and the Locke brothers close behind, now its a race against time. The closer and the closer Bando get to the Spire the more hope Dana begins to lose believeing that no one is coming to rescue her as the brothers in pursuit are facing many obstacles slowing them down. The final showdown betwen the sparring side was amazing the so many different side battles going on it is hard to keep your focus trained on one character for very long. The last 30 pages were absolutely brilliant I love how Hunter perfectly blends fantasy with reality, magic with spirituality and everything in between so flawlessly that you just fly through each episode with such ease and it isn't until you read the final sentence that everything sinks in all at once. Overall I highly recommend this novel to all lovers of fantasy, sci-fi and action novels. It was perfectly written with some amazing characters all of which are unique with distinct personalities, morales and voices or in one case lack of. 5.0 out of 5 starsThroughly enjoyed! I've read books by this author previously & keep an eye out for more. T/B/L is a great dystopian novel about identical triplet teenagers in a post apocalyptic world. Spooky forests, gigantic worms, 1/2 man 1/2 🦇 creatures, a dash of G rated romance, search for gold & beating the bad guys at their own game are just some of what you'll find. The boys also each have their own "super power": 1 has a power house voice, another, incomparable hearing & the 3rd... well, you'll have to read the book to find out. I'd definitely classify this as YA, but I'm old :) & loved it. Good life lessons inserted but never in a pedantic way. Recommended for most age groups. Although this is not a genre that I normally enjoy, I was captivated by the way the words paint a picture (sorry for the cliché). The characters, dialogue, and the general story really dragged me in. I read this with my son, and we both enjoyed; it is appealing to older and younger readers. The story had a theme of friendship, family, and what can individuals are capable of under extreme circumstances. The ending admitttedly made me emotional, but it also uplifted me. I LOVED the characters Mouth and nerdy Kale. I knew K.C. Hunter as a Podcaster. He did reviews for pop culture stuff. I never knew he was an Author until this year. I was hooked on this book from page 1. What hooked me? I say the main characters for whom this book are built around. Plus the way it was written never angered me. I understood every single line. If you like Superheroes and Harry Potter then please give it a try!! Great story, with a few twists that wasn't expected. I hope that you write some more about the Brothers Locke. An action packed, well-paced journey into a new world. While it stands on its own (and could easily be a continuing series) I am eagerly anticipating what comes next in its companion series, Dorian Delmontez.